I hope you guys had a great weekend! 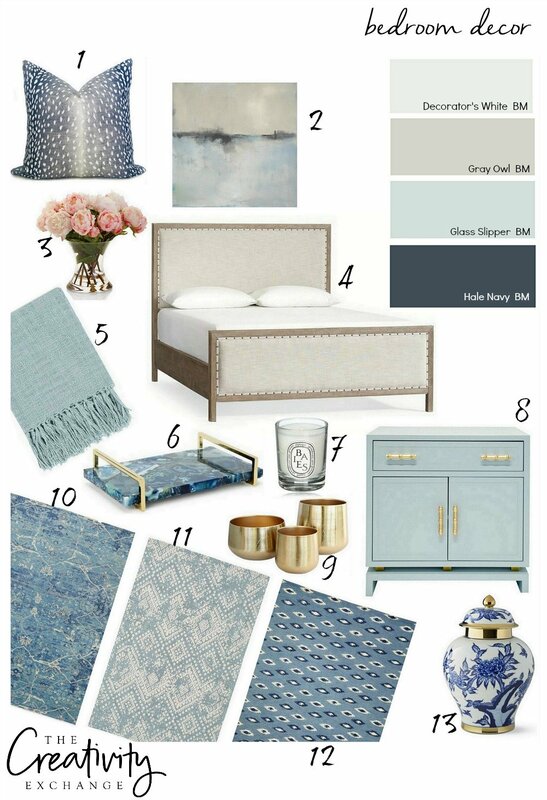 It’s time for another Moody Monday and today, I wanted to inspire you with some beautiful bedroom decor ideas. 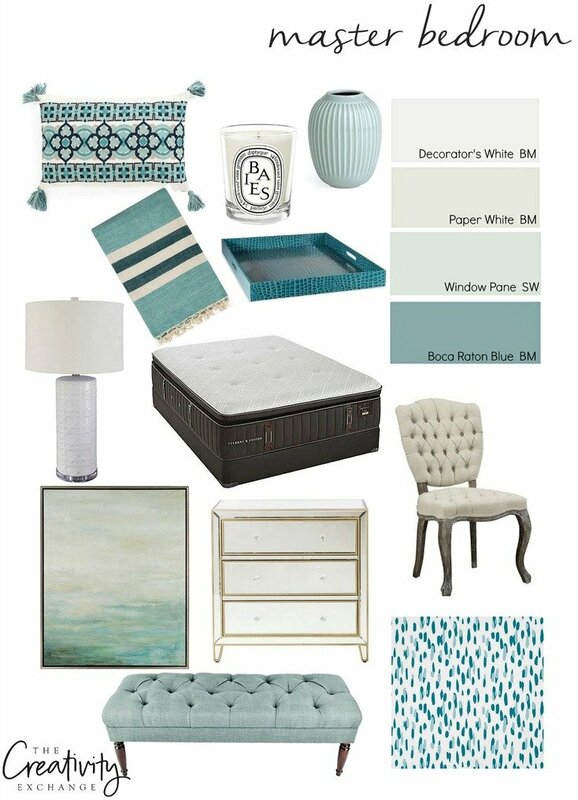 I also want to share some super quick tips for where to start when choosing a bedroom color palette. 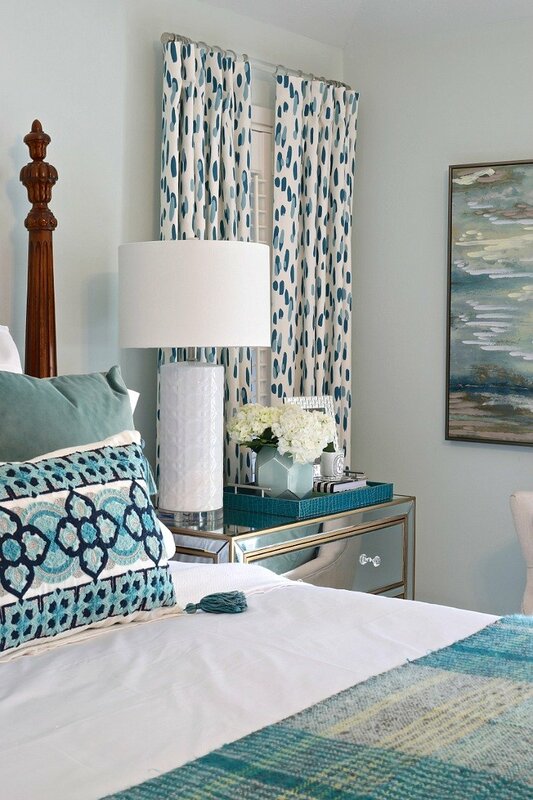 Choosing a color palette for a bedroom makeover can be overwhelming. Where to start, right?! I can’t tell you how many people always start with a wall color first. 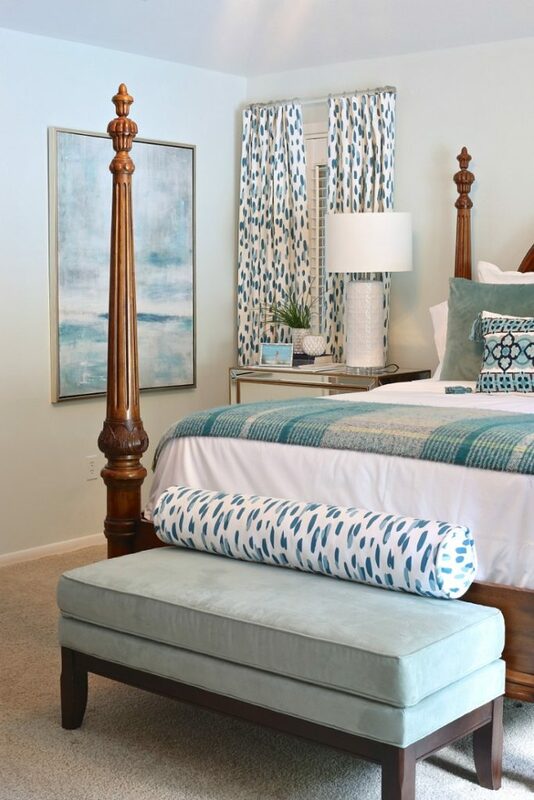 I don’t recommend that because if you paint your walls a light shade of blue or a cream, you may fall in love with a rug or a great piece of art when you start layering the space and you will wish you would have waited to paint the walls to pull out a certain color. 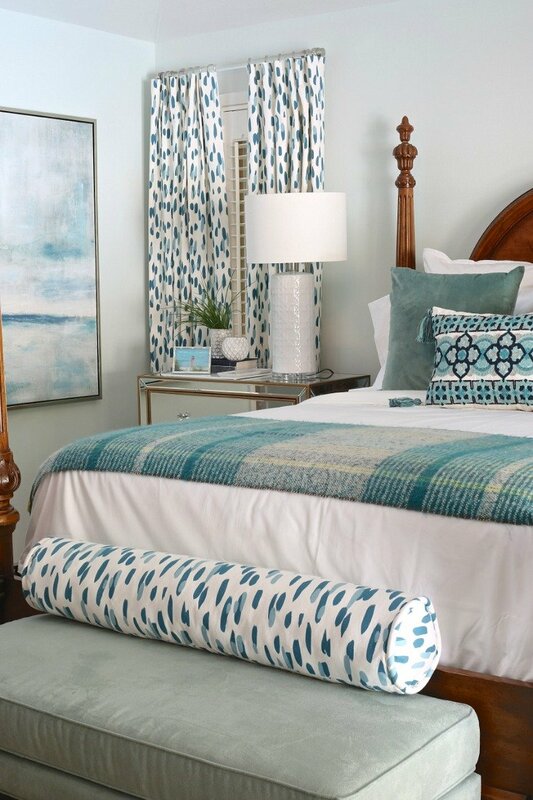 The best place to start is by finding your rug first, especially if you want some color and pattern in your bedroom. If you plan on doing a neutral or solid rug, start with either art or patterned pillows that you love. 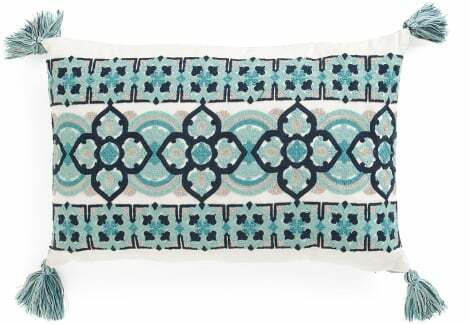 In my own bedroom, I used this pillow as the inspiration for the color palette for my bedroom makeover. 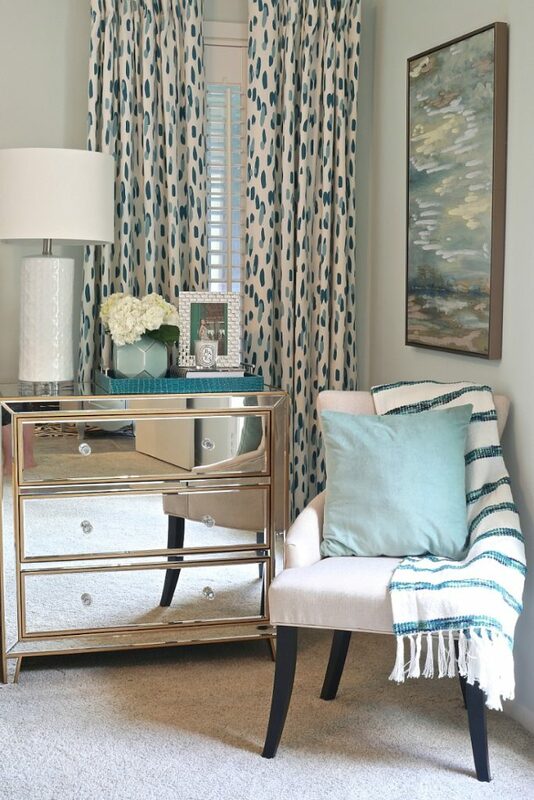 Creating a color palette for a space starts with color. Even if your space is going to only be neutral, you need to begin by pinpointing your dominant color and go from there. 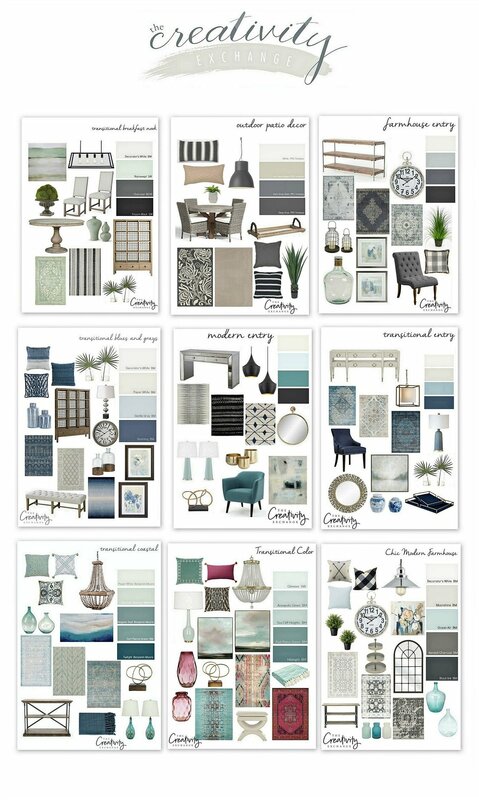 Choose a grounding main color, a complimentary accent color and two light neutral colors and you will have your color palette. Most importantly, choose a color you love and that relaxes you. I have a rule I always stick to whether I’m designing a bedroom for a client or my own home; bedroom decor and furniture needs to be functional first and beauty second. 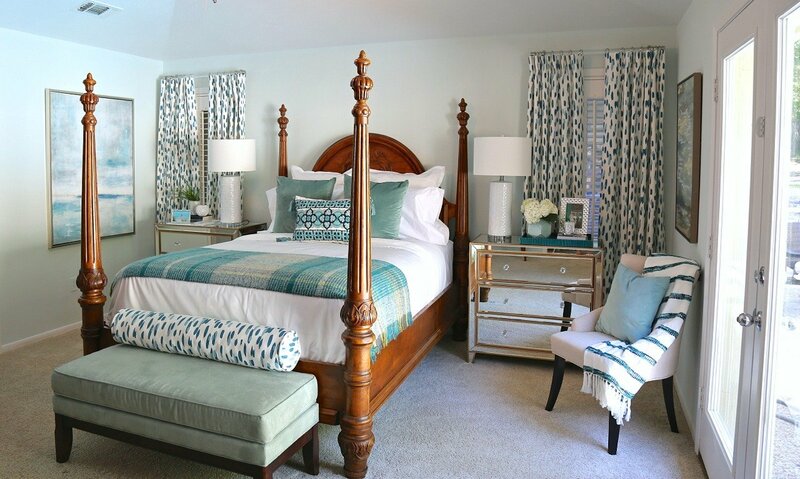 The bedroom should be a sanctuary and not a source of stress and having a very comfortable bed and plenty of drawer space in nightstands/dressers is the main priority. 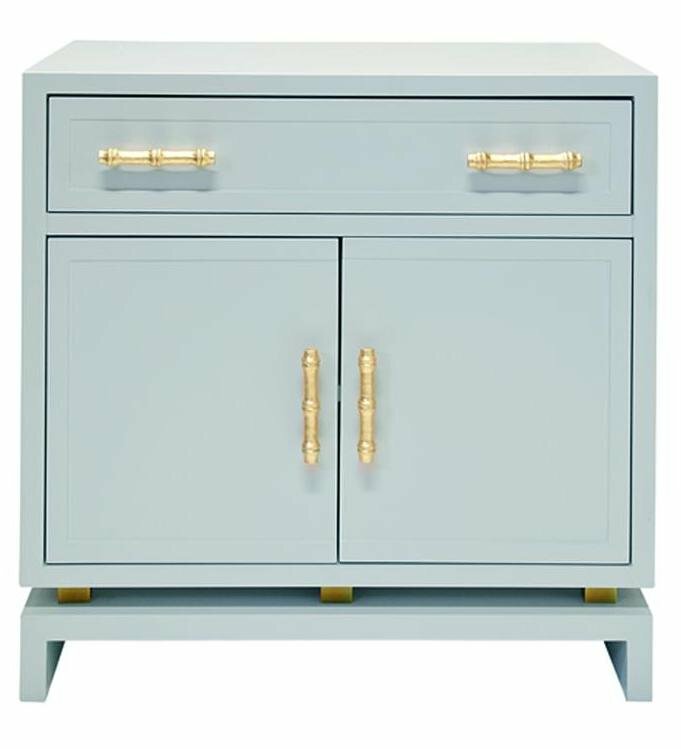 Instead of choosing a nightstand that doesn’t have a drawer, choose a narrow dresser about 30″ tall with three drawers instead (or a piece that has plenty of storage). 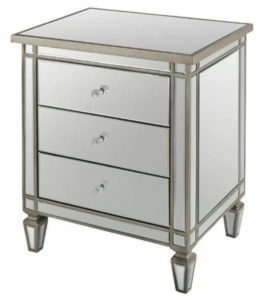 A more budget friendly option would be a mirrored three-drawer nightstand. You can never have enough storage in the bedroom, especially if you have a small closet! If you have plenty of storage space in the bedroom, everything has a home. 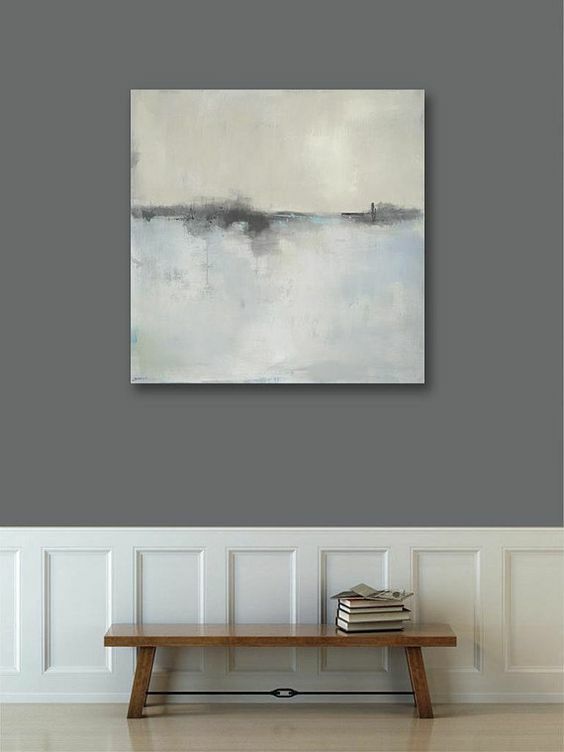 Look for decor pieces like art and accents that you love and that relaxes you. 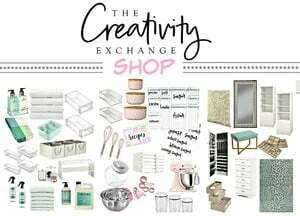 You don’t have to spend a fortune for great art and Etsy is a fantastic place to look for beautiful art and artist that inspire you. Surrounding yourself with things that you really love makes for a more serene and relaxing space. Trays, trays and more trays is my motto! 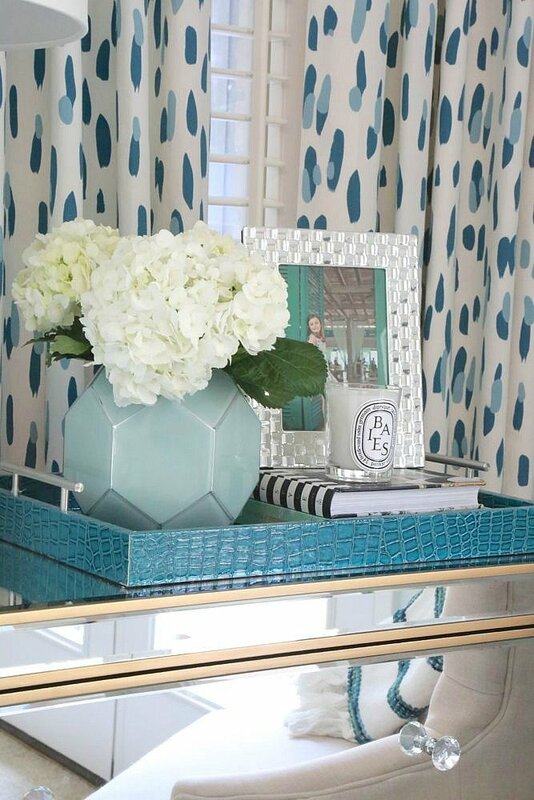 Trays add an additional layer to nightstands/dressers/side tables and you can get them in fun colors or textures to accent. Better yet, layering books, frames and flowers on trays makes it easier to quickly clear a dresser or nightstand by just moving the tray. I love to look through all the trays at Wayfair here because they carry very inexpensive ones in every color and texture imaginable! 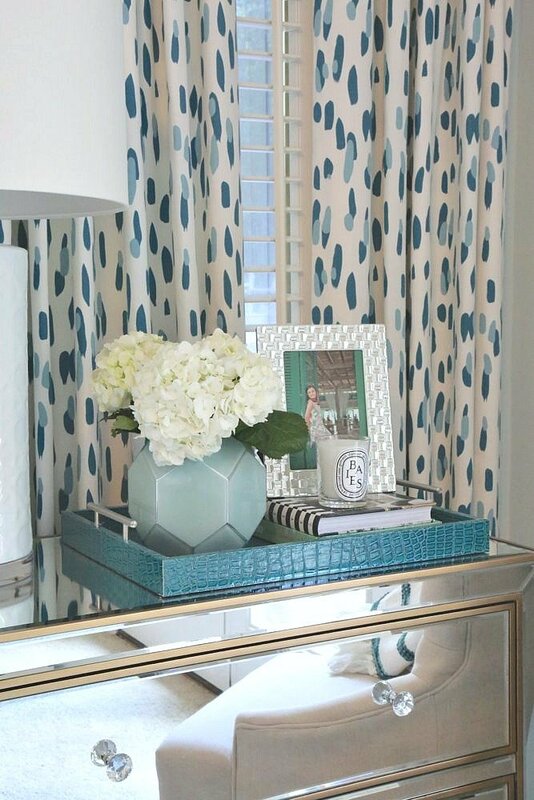 Other bedroom decor to think about is flowers and vases. 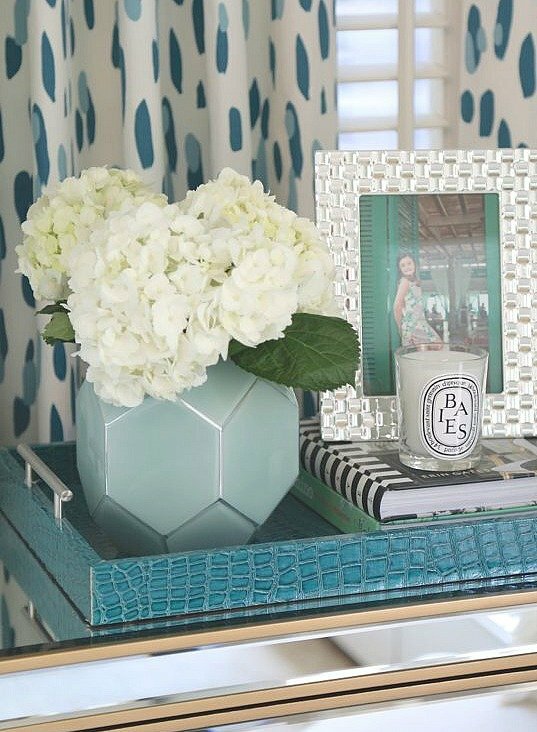 I LOVE fresh flowers on my nightstand and I picked out a vase for my nightstand that adds a pop of color in a modern design. It’s not always possible to keep fresh flowers all the time and there are some beautiful faux flowers that look amazing. A little warning here though.. The most realistic faux fresh flowers will be very expensive but they look absolutely real like these below from Horchow. Horchow’s faux flowers are hands down the best and most realistic faux flowers out there but they will run anywhere from $150-$500. They even have the faux water. Just look through all of Horchow’s faux flower arrangements here and you will see what I mean about the quality of higher end faux flowers. 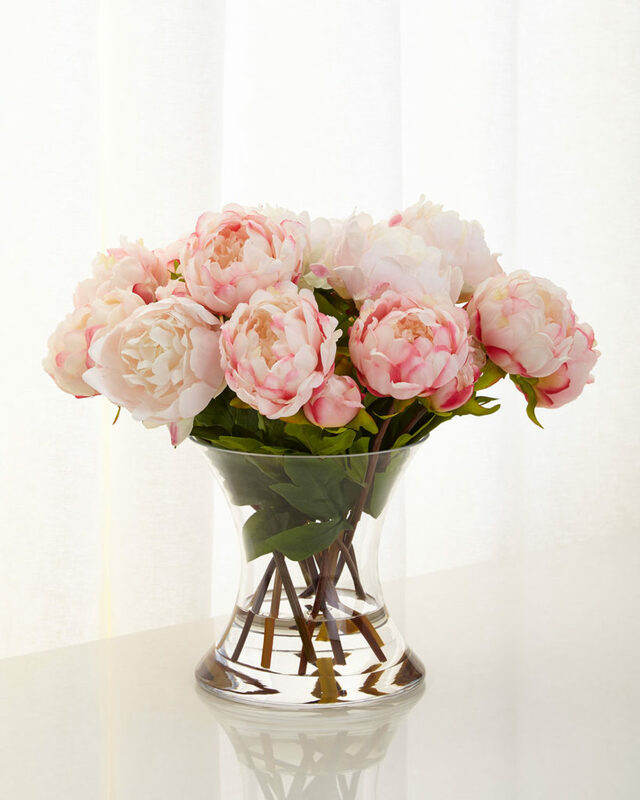 For more budget friendly faux flowers, check out Wayfair here. Bedroom seating is so important but I’m always amazed at how often I see bedrooms without an seating whatsoever. 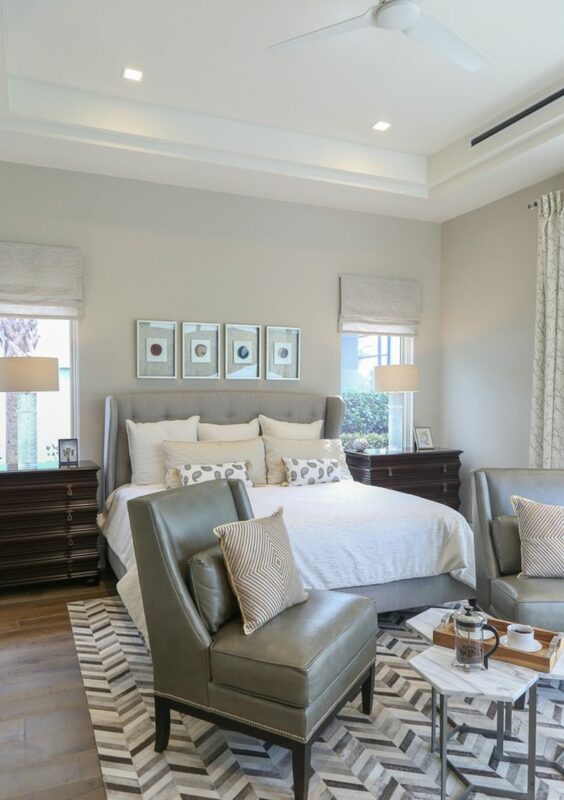 Not only is it functional (putting on shoes or relaxing without getting into bed), bedroom seating can be beautiful and add pops of color or texture. Throw blankets are another pretty way to add a pop of color but there are some cold nights in the winter where I am so happy I have a bunch of throws on my bed and bedroom chair. Instead of taking up space in my linen closet, I always drape throws in every room over chair corners and even in baskets. 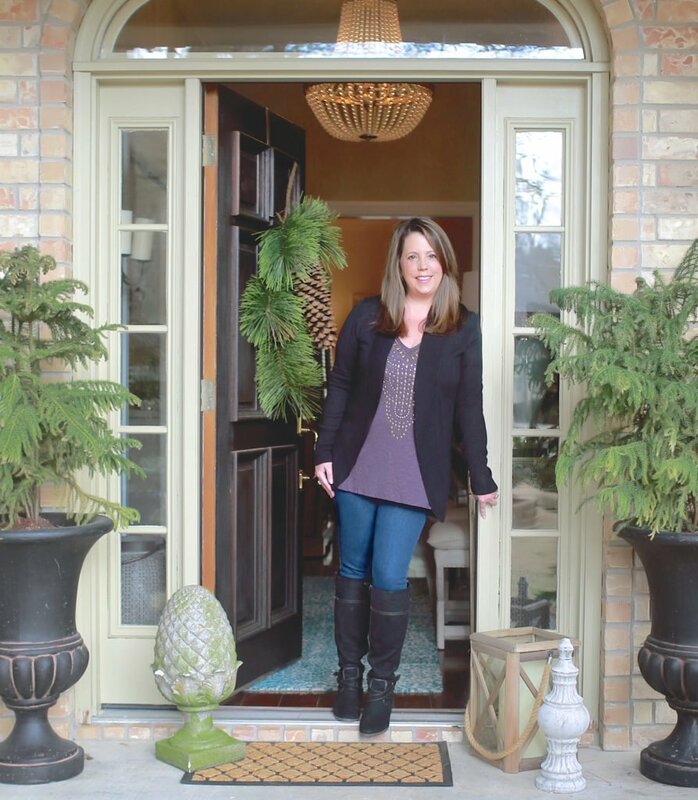 Creating a serene, calm but functional space is the best thing you can do for yourself. I love being surrounded by my favorite colors and comfort. If you want to go back and look at past Moody Monday’s, you can click on the image below to see them all in one place. The first bedroom design is right up my ally but all of them are just gorgeous!